Perfect combination of green and blue color. The ground of this carpet is in green color and the madallion and border of this carpet contain blue color with tiny motif. - Gorgeous handmade carpet is in pure silk. - This carpet is made of very fine quality silk which is produced in China. - If the material is not pure silk then weavers can never make an intricate and detailed design like this. - It has very intricate design and tiny pattern. 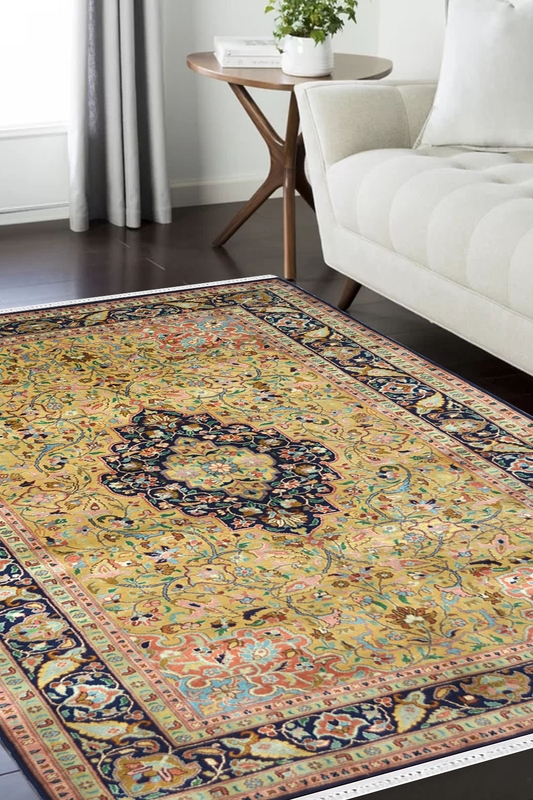 - This silk carpet has Medallion Kashan design which is very popular. - It has taken about 9 months to weave. - It has an extremely detailed pattern. It has a flour pattern in the ground with very tiny motifs.